Ah, Memorial Day, the official ‘kick-off’ of summer, is finally here! 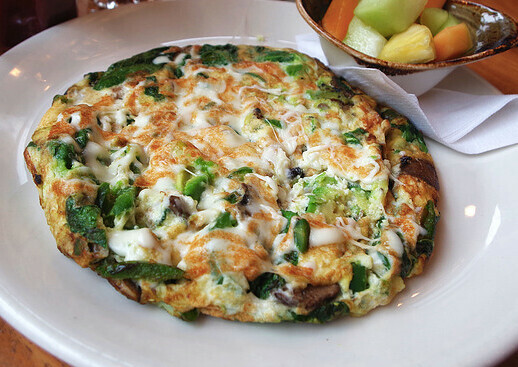 We love Memorial Day for many reasons, but the extra day to brunch is high on our love-list. We have compiled some of our favorite Memorial Day brunch spots from last year, and some new happenings this year, to provide you with the best Brunch and booze ideas on how to spend your MDW. Brunching aside, we’ll be taking time this Memorial Day to remember all those who have bravely risked their lives to protect and serve this country. Cheers to that! Commonwealth Tavern will open at 10 a.m. Saturday, Sunday and Monday of Memorial Day weekend for a family-friendly brunch available until 2 p.m. Weather permitting, guests can enjoy Commonwealth’s dog-friendly patio with seating for 24. Perfect for Memorial Day dining, Commonwealth’s brunch features items like the Breakfast Burger, Buffalo or BBQ Wings, and even a Pigmuffin (maple pig head, farm egg, American cheese, English muffin, fries). While dining, guests can enjoy a $3 Build-Your-Own Mimosa Bar and $6 Build-Your-Own Bloody Mary Bar. 2000 W Roscoe Street. Kanela Breakfast Club locations will offer al fresco, dog-friendly dining . Guests can sip on new seasonal cocktails all weekend long including the Cinnamon Toast Brunch (vodka, Kahlua, and Rumchata), Ginger Paloma ( tequila, grapefruit juice, lemon juice, and ginger syrup) and the “Tony Danza” (Bison Grass Vodka, lemonade, iced tea, Peychaud’s bitters, and strawberry). We love this place for brunch and definitely think its the perfect option to get your day drink on the Memorial Day! Oyster Bah is one of our favorite restaurants in Lincoln Park, and we’ve already done the due diligence of testing out the brunch menu! The East coast inspired fish restaurant has a carefree vibe that’s perfect for a Monday off work. 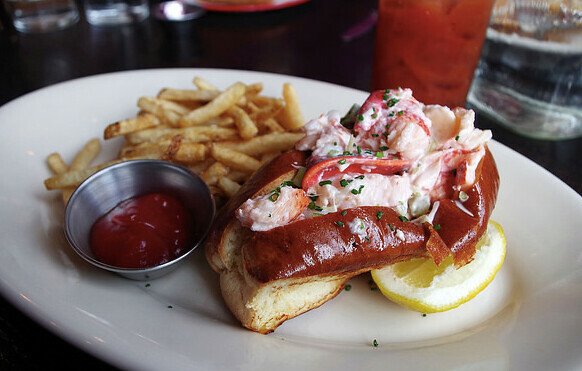 We loved the Bloody Mary accompanied by a jumbo shrimp and the buttery Maine lobster roll is a must. Read about our brunch at Oyster Bah here. 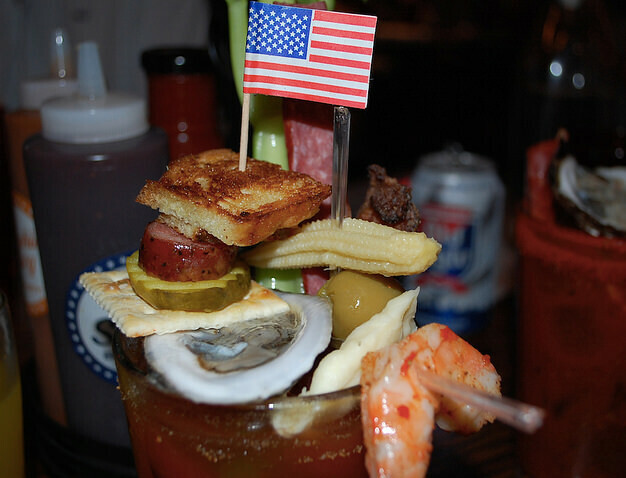 Oyster Bah will serve brunch Memorial Day from 11:30 a.m. to 3 p.m. 1962 N Halsted St. Chicago, IL. It’s no surprise that Bub City is one of our favorite spots to celebrate ‘Merica holidays. You can’t go wrong with live country music, authentic Southern cooking, and a huge Bloody Mary bar on Memorial Day. And take note, the bacon and sweet corn waffle does not disappoint. See what else we loved about the Bub City brunch here. 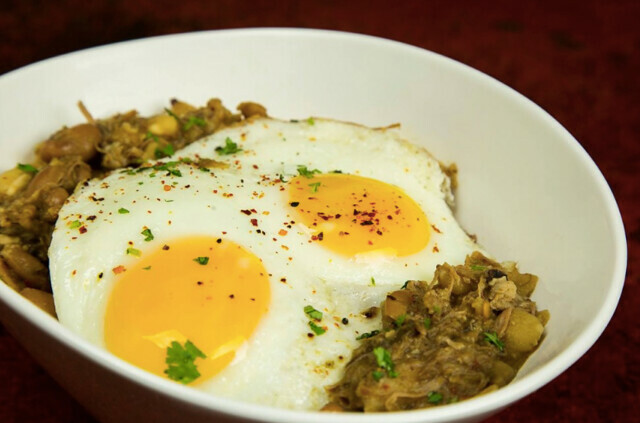 Bub City will serve brunch on Memorial Day from 10 a.m. to 3 p.m. 435 N. Clark St. Chicago, IL. STK has unveiled a new spring menu including a baby gem lettuce Caesar salad, grilled Spanish octopus, jumbo lump crab cake, Alaskan black cod and foraged mushrooms. Also, the restaurant is participating in the James Beard Foundation’s Blended Burger Project with its “Juicy Lucy” Blended Burger—a foie gras and maitake mushroom burger with brie cheese, tart cherry mustarda and fire-roasted chiles on a housemade bun—that’s available starting Memorial Day through July 31. We suggest giving it a try! 9 W. Kinzie St. In the heart of Wicker Park. you’ll find one of our favorite brunch menus at Chop Shop. We love it not only for the menu, but for the hidden-gem patio and large indoor dining room, which means no long waits for brunch! We particularly enjoyed the bacon and cheddar biscuits served with warm honey butter, and prosciutto wrapped buratta. Both are perfect for sharing with your Memorial Day crew! See what we thought of Chop Shop brunch here. Chop Shop will serve brunch Memorial Day from 2033 W. North Ave. Chicago, IL. If you’re looking for a foodie-approved brunch spot on Memorial Day, head to The Dawson in West Town. The huge industrial-chic space is perfect for a fancy-pants date with your gal pals, and if the weather is right, the patio is perfection. 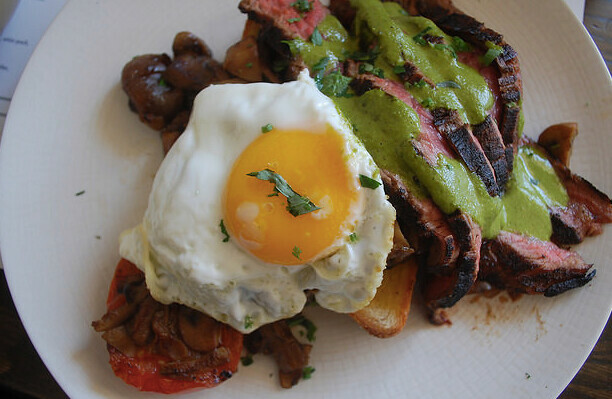 We love The Dawson’s fresh twists on traditional brunch menu items, one of our favorites is the Steak & Eggs! Read our full review of The Dawson here. The Dawson will serve brunch Memorial Day from 10:30 a.m. to 3 p.m. 730 W Grand Ave. Chicago, IL. With locations across the city, Meli Cafe is one of the best convenient week-day brunch spots. The brunch menu boasts fresh squeezed juices and quite a few healthy options, making it easy to stay on track with your swimsuit body regiment, even on Memorial Day. We particularly loved the avocado toast, piled high with fresh veggies and perfect for sharing. Read our full Meli Cafe review here. Meli Cafe will serve brunch Memorial Day all day. 500 South Dearborn St. Chicago, IL. If you haven’t heard of Publican Quality Meats, don’t fret. It’s simply a smaller dining room near its larger sister restaurant, The Publican. 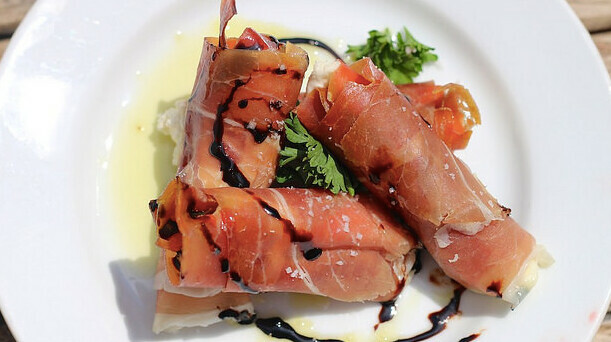 Both have an amazing brunch menu full of cured meats and traditional brunch favorites. Not to mention, the patio dining is perfect for Memorial Day brunch! Read about our brunch experience here. 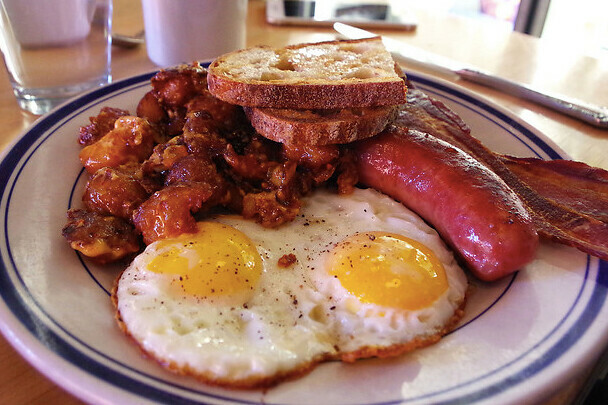 Publican Quality Meats will serve brunch Memorial Day from 9 a.m. to 3 p.m. 825 W. Fulton Market, Chicago, IL.